Happy Thanksgiving, my fellow Americans. I painted a turkey for the occasion, along with a pheasant. That pheasant was especially fun to paint—so many colors and speckles. The skunk, deer, and raccoon were painted last summer, but I hadn't photographed them before now. 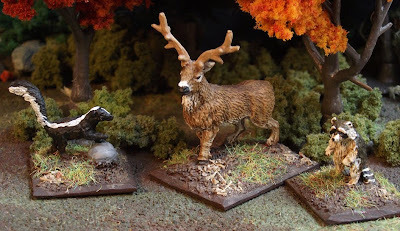 These are all Mega Miniatures 25/28mm models mounted on 20mm square bases (the deer's base is deeper). I'm a big fan of animal models, and Mega Minis has some really sharp sculpts. I found out why these birds are called, "Turkeys." Before colonizing America the English were fond of eating large game birds which arrived via trade routes through Turkey. Consequently, these birds were nicknamed, "Turkeys." When the colonists arrived in the New World they saw the similarly-sized native birds and gave them the same name. 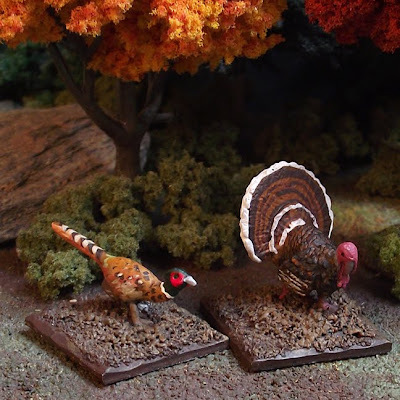 If you'd like to see some the 1/72 scale turkeys and pilgrims I painted in February click here. 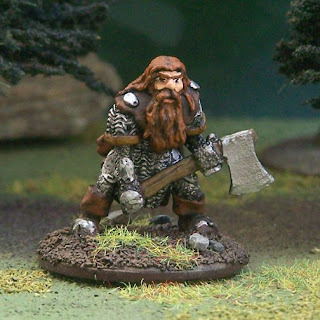 I was looking through my old unfinished blog posts and found this shot of a Grenadier Fantasy Warriors dwarf. I believe this was sculpted by Nick Lund. I got him on eBay and painted him to be Gimli. The rest of my in progress 28mm Fellowship of the Ring is made up of models from Vendel Miniatures models and Mark Copplestone. You can see my Strider and Gollum models in an old post. 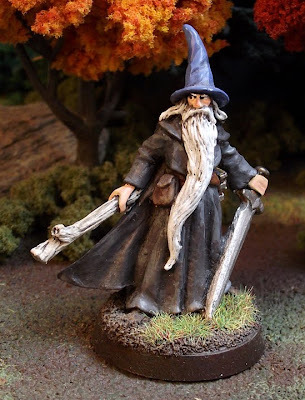 I painted the Copplestone Castings wizard as Gandalf a few years ago. I'll have to take his picture this weekend. 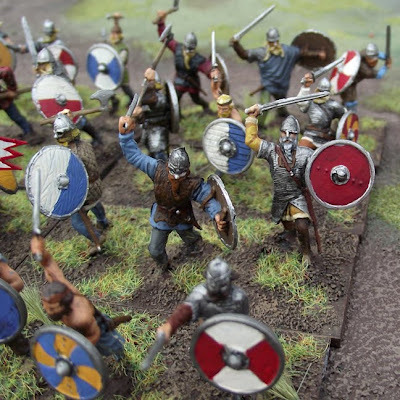 I finally finished my 1/72 plastic army of vikings to play De Bellis Antiquitatis (DBA). It's a mix of Zvezda and Emahr/Imex models. The last DBA armies I made were the Romans and Gauls painted way back in 2000. I'd like to think my paint skills have improved since then. 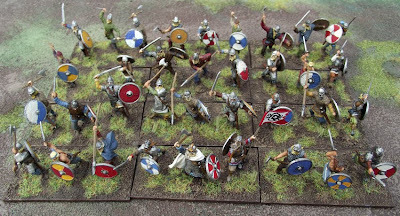 I half-finished a 15mm Dacian army 2 yrs ago, but I gave up. I'm just not into painting 15mm. 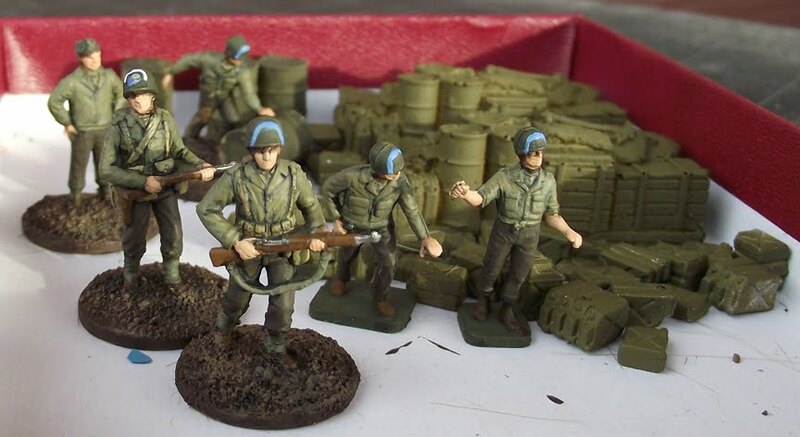 These 1/72 models are based following the 25/28mm base size rules. However, you'll notice all the bases are the same 30mm depth and all the blade elements have 3 models. I did this for a few reasons. The army list for III/40a calls for eight 3Bd elements and 1Ps (which are all 30mm deep). That left only three elements with a different base depth. I've always thought it was kind of dumb that the same element, whether 3Bd or 4Bd, had different depths. I realize this has to do with using the same bases for other wargame rules, but I'm not into that. I wanted all my infantry stands to be a uniform size. It's difficult to fit 4 models in an even row on these 60mm wide bases, and adjusting this army to all 3Bd saved me on some painting time (because of fewer models). On Tim's Miniature Wargaming Blog you can see he tweaked the rules to make all his infantry bases a standard 40mm deep. He does this to fit two ranks of troops on a single base, thereby creating more of a big army look. As for my vikings, I prefer to think of this as a raiding warband from a single ship—not a representation of a full army. I didn't do anything especially clever with conversions except for the general's paper banner and the viking seen above with the red shield. This Emhar figure (painted in the yellow tunic) was holding a mace in his left hand. I trimmed off the weapon, glued on a Zvezda shield, and painted his fist to look like the iron shield boss. My wife recently bought a new camera for her food photography, so I finally have a way to take some decent quality photos. Click on any of the images for a larger view. And you can see close-ups of some of these elements in this previous post. You can listen online to a BBC Radio 4 piece about the Volga Vikings, those who travelled east into modern Russia. It just aired today. Also check out BBC Radio's older series, The Viking Way. Thanos painted these same models over on his blog Miniatures and Terrain. 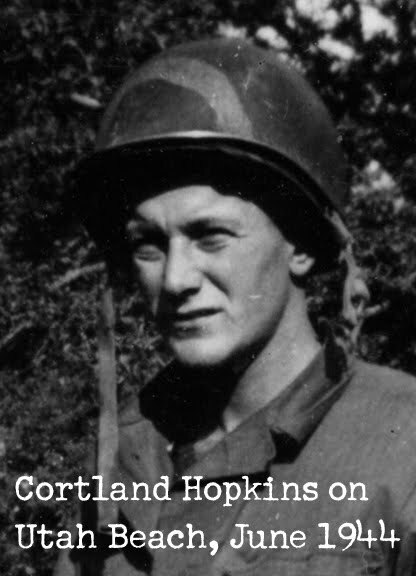 WWII veteran Cortland Hopkins will be signing copies of my book, Longshore Soldiers on Veterans Day, November 11, 2010. Copies of the book will be sold for $20 this Thursday at Evergreen Commons, 1070 Luther Road, in East Greenbush. Cortland will be sharing stories and signing autographs from 10 a.m. to 2:00 p.m. A portion of sales will go to Evergreen Commons' activities & entertainment budget.